Technical and Progressive Death Metal are the pair of genres in which the stylings of San Francisco Californian natives Fallujah like to construct their music. After a 10 year stint in the band, vocalist Alex Hoffmann exited stage left in 2017 and after an extensive search, the band brought in Anthony Palermo, who had previously worked on the bands side project Underling for this new album. The band have been ones to change their line-up on a number of occasions so the exit of Guitarist Brian James in 2018 will also have come as no surprise. One thing has however remained the same – the presence of lead guitarist Scott Carstairs and drummer Andrew Baird – throughout the bands career. “Glass House” opens things up and gives Palermo the chance to showcase his vocal range with some impressive clean and unclean work on a faster cut soaked in a dark atmosphere. Carstairs adds an epic face melting guitar solo in the final minute that gives the song a real moment of magic. “Last Light” got a lyric video release on the day of the album release and maintains that driven high energy pace of the opener with some impressive riffs. There are a pair of wonderful melodic bridging movements that bring the whole thing together nicely and allow for the return to the hook which work really well. “Ultraviolet” appeared a month ago and has been a live staple since, giving fans a flavour for this album in advance of its release and a taste of Palermo’s vocals. While they are impressive, the kit work from Baird is something that really stands out with blast beats, crash symbol hits and some serious footwork. The shortest cut on the album at just 3 minutes and 21 seconds, it’s one which could actually be extended but instead ushers in the longest cut on the album in “Dopamine”. Bassist Rob Morey, who it should be said has been in the band for a decade, lays down some dirge and funk bass grooves that are given more of a chance to shine when the guitars drop out almost completely during some of the more melodic vocal passages. 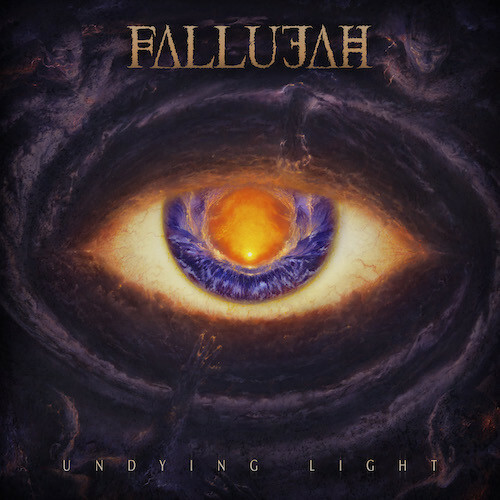 The track showcases what the Fallujah sound has evolved into over their career and manages to combine all the elements of the album in one single tune of epic proportions. “The Ocean Above” showcases Palmero’s uncleans and includes a surprise “Blegh!” in the opening verse. A vocal layering effect is used to give an echo clean vocal underneath the unclean layer in a couple of places that adds a haunting quality to the sound. A mid song almost Sitar like passage is a surprise instrumental melodic part that breaks for a return to the main heavy riff but continues to permeate the track for the final verse before closing it out. “Hollow” keeps that atmospheric darkness with some ambient guitar layering that sits underneath the chugging main riff. The mix allows each element space and each musician the opportunity to shine. Carstairs guitar work has a razor sharp precision and the Progressive elements are perfectly in balance with the perhaps more melodic end of the Death Metal scale gravity. “Sanctuary” comes out of the gate faster with some blast beats and a bass sound that is accompanied by a lead riff that perhaps shows some Swedish Death Metal influence. On an album of polished song craft, this one stands out above the pack with some pummelling kit work and bold vocal phrasing. “Eyes Like The Sun” has some jazzy interlude work that manages to serve the song itself rather than noddle for noodling’s sake which is a pain that a number of more progressive releases have been known to suffer. “Distant And Cold” has a whispered atmospheric vocal quality that brings to mind a whole other genre of music with a Space Rock ambient tone. The epic nature of the slow and surprisingly untechnical guitar work adds a completely new dimension to the album and if it wasn’t for the clean and crisp kit work, you might think the track belonged to someone else. It’s a sound fitting of the song name. “Departure” steps back into the album sound as a whole with Palmero’s growl, blast beats and melodic Swedish Death Metal riffs a plenty. Some have likened the vocals to Devin Townsend or even former The Haunted vocalist Peter Dolving. It’s a decent way to end the album and means that “Distant And Cold” doesn’t feel simply tacked onto the end.